two-way metal clasp bags produced by MONOCIRCUS. 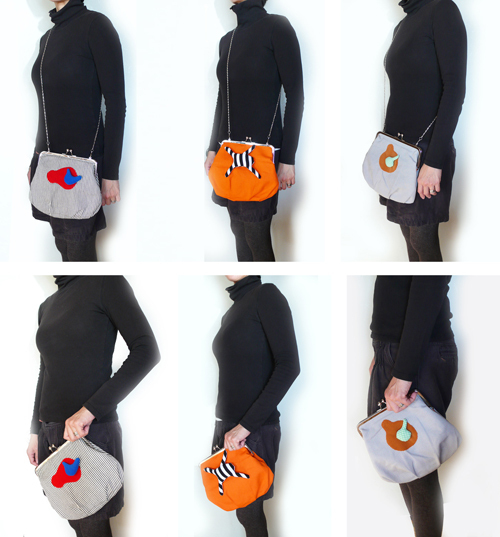 comes in three variations: striped, orange canvas and grey canvas. each has a plush patchwork sewn on and comes with a stainless steel metal chain. you can carry it like a chic clutch bag or as a shoulder bag. they are 25 cm wide, great for luncheon or cocktail parties or any smart casual occasions. stylish and unique. there is nothing like this elsewhere!